Download PDF version of this article HERE! 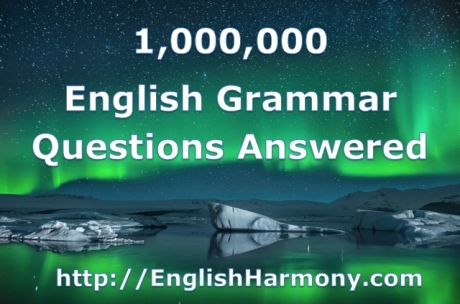 In this article I’ve combined all the English grammar-related questions from your comments on my previous article where I asked you to ask me any grammar questions that have been bothering you lately. I’m going to answer all of your questions in an easy-to-understand manner so as to not make you even more confused. I mean – what’s the point in providing an answer if it’s even more confusing than the original question, right? So basically when answering the questions, I’m not going to start throwing a lot of grammar-related terms around. Instead, I’ll provide simple and commonly used examples of how this or that particular grammar construct is to be used correctly and then you can take my advice on board and start using it the same way. Remember – it’s by far easier to learn one or two ways of using a certain grammar rule than to try and apply that rule on your entire speech! If you try to do the latter, you’ll start analyzing your speech too much and that will inevitably lead to fluency issues. So, without a further ado, let’s cut to the chase and let me answer all of your questions, my dear blog readers! “Being” can also be the present participle form of the verb “to be” and in this case you use it in sentences such as “Hey, stop doing that, you’re not BEING nice to me!” The basic rule here is to use the present participle “being” when describing some person’s behavior. So remember Suny – it’s either a human BEING, or someone is BEING a certain way, or you’re describing BEING in a certain state of mind – these are the 3 most popular ways of using the word “being”. I’m not really sure what’s the difference between “I have figured it out” and “I have got it figured out “. For the record – I actually know the meaning but why it confuses me is the following. “I have done it” normally means you did it on your own and “I have got it done” suggests you got someone else to do it. Some natives speakers, however, use BOTH of these phrases in the same situation where they simply want to explain they have done it which should normally be described as simply “I have done it “. So my question is – why do native speakers use ” I have figured it out ” and ” I have got it figured out ” interchangeably? Thank you! which are totally interchangeable – “I have a car” and “I’ve got a car” mean the same exact thing. Just because someone says “I have got it done” doesn’t necessarily mean they’re stressing that they got someone else to do it. They may be saying it just because they use “have got” form instead of “have” form of the verb “to have”. Yes, it may very well be the case that they mean they got someone else to do it, but you can’t tell it by this single sentence! So the answer is – native speakers say “I’ve got it done” instead of “I have done it” simply because they’re using the “have got” version of the verb “to have” at that particular time. It doesn’t necessarily mean they got someone else to do it! Could you please help me to create complex sentences easily? I want to be able to use high-level English, and I don’t want to be perceived as if I’m using only simple language! When I try to create complex sentences, I’m getting lost a little bit .. And then it’s all getting too complicated for me. I think that when it comes to writing them, I’m thinking in a too complicated way. Give me some examples how to use good phrasal verbs, and what makes to make you feel that sentence is strong, written with high level words. Could you please give me some list of good words which can be used in essays? Hi Tornike. You’re actually answering your own question in the answer – you want to be able to do everything at once – speak and write using sophisticated English language and complicated grammar tenses while at the same you’re admitting that you’re GETTING LOST and it’s all too COMPLICATED for you. Well, guess what – don’t try to use complicated grammar constructs before you haven’t become familiar with simple ones first! Please read this article where I’m talking about the importance of not learning complicated English grammar tenses too soon. And also, please read this article where I’m explaining that no English grammar construct is too difficult if you learn it the right way. Read it carefully, read it a few times till you start understanding what I actually mean by saying that you have to treat each grammar construct individually and don’t try to apply general grammar rules onto your speech and writing but rather learn each new phrase and sentence as an individual language unit. Want me to give you a list of good sample sentences? Then look no further than these idiomatic expressions – they’ll provide a solid basis for your written and spoken English improvement. I didn’t get my system yet. I don’t get my system . Both should be pronounced in the Present Tense. Hi Deepak, you’re saying both of them should be in the Present Tense? If that’s the case, the first one should say “I haven’t got my system yet” – that’s the Present Perfect Tense and then both of the sentences would be correct because both of them would be in the Present Tense. Answer to below question is C, but I think A is also ok. So I just want to know the difference between “wouldn’t” and “shouldn’t” in this situation. Thank you! It’s said there are plenty of hotels in that town. There … be any difficulty for you to find somewhere to stay today. You’re totally right – the A option is also grammatically correct PROVIDED you would continue the sentence by using the word IF and then explaining the circumstances under which there wouldn’t be difficulties finding somewhere to stay. Hi Vitali, this is a very valid question. I could start going on about using commas to separate independent clauses and so on, but once you asked what’s the easiest way to go about it, here’s the only rule I go by – I use a comma when it feels right, I basically use it whenever I would PAUSE my speech if I were to speak it all out loud. Try it, and you’ll realize it works! Hello Sarath. DO, DID and DOES is the very same verb “to be” conjugated depending on the time and the person. Most commonly it’s used in a response to a question when you’re asked if you did something, for example, or if you feel a certain way. DO you love me? Yes, I DO! DID you buy bread? Yes, I DID! DOES your sister know I’m home? Yes, she DOES! And here’s a very simple way of knowing which one to use. Just repeat the one in the beginning of the question! So, for example, if the question begins with DOES, your answer is going to end with DOES as well – you just have to figure out which pronoun (he or she) to use, but it’s quite easy to guess from the question alone. I mean – your sister is obviously SHE etc. Hi Hugo, NOT ONLY I’ll tell you how to use the expression “not only… but…also…”, BUT I’ll ALSO provide you a few practical examples on how it’s to be used in real life. But wait… Did I not just do that? You see – NOT ONLY I’m trying to be helpful when explaining grammar-related concepts to my blog readers BUT I ALSO like injecting some fun and jokes into my explanations which makes our lives so much more brighter, don’t you think? So basically whenever you want to explain that you’re going to do something EXTRA, something ON TOP what’s required – that’s when you use this particular English grammar construct. Can you propose an easy and practical way of learning for this case? Yes Nick, I’ve received questions about the Subjunctive Mood previously, so let me explain it to you in easy-to-understand terms. Subjunctive Mood affects English verb forms in statements where you or someone else expresses a hypothetical possibility, a recommendation or a wish for something to happen; basically when people are talking about something that ISN’T actually a fact but could possibly become a reality if certain conditions are met. Typically the Subjunctive Mood can be observed in English in a sentence beginning with “If I WERE…” Normally you would kind of want to say “If I was…” because “I” is normally associated with “was” and it’s only “you, we and they” that are associated with “were”. Subjunctive Mood, however, stipulates that if you make a hypothetical statement about what you WOULD do or what you WOULD be IF something were to happen (notice how I used “were” instead of “was”! ), “were” replaces “was”. Speaking of other grammatical forms of the Subjunctive Mood such as “My boss strongly implied he wishes all cigarette breaks BE (instead of “are”) done away with immediately” – to be totally honest with you, in conversational English such and similar grammar forms are gradually replaced by the more traditional, Indicative Mood. Here’s a very easy-to-understand guide on the Subjunctive Mood – you really shouldn’t read anything more detailed and complicated because it will literally make your head spin! Whenever you use the following English phrases: “It’s high time…” and “It’s about time…” (they both mean the same thing – basically it’s a suggestion for the other person to do something) and you DON’T use the following words right after them “for… to”, then you have to conjugate the verb in the PAST TENSE. For example, if you say: “It’s about time FOR you TO GO home” – that’s when you say GO. If, however, you say: “It’s about time you” without using the “for” and “to” – that’s when you change the verb to its Past Tense and the sentence becomes “It’s about time you WENT”. This grammar construct is created similar to the Subjunctive Mood as explained just above your question, by the way! Hello José, as a general rule you don’t use the definitely article “the” (it’s also called a “zero article” – basically it describes the lack of any articles) when describing GENERAL and ABSTRACT concepts and things in English. Love and hate aren’t the opposites. It’s indifference that’s the exact opposite of love. Money is never enough, you always want more money! Amazon is the biggest river in the world in terms of the geographical area it covers. I would suggest, however, not to be too focused on applying these rules when speaking in English because you’ll develop a terrible habit of over-analyzing your speech. Just use the articles “a”, “an” and “then” whenever it feels right, and provided you’re working on your English on a regular basis, you’ll develop a “gut feeling” for correct English. That’s what I did as well! In this particular case the second sentence is how I would say it because “estimated budget” is the correct English collocation describing a budget that is based on a forecast of future expenses and income. I’d rather have my worst enemy stay overnight with me than my in-laws, I hate them! I’d rather go, it’s about time! I’d rather you stayed at home – it’s too cold outside. This is Ashkeen Ahmed from India. One of the English trainers says that English language has two alphabets. He is Rajiv Gandhi Excellence award winner in English. I’m guessing what the English trainer meant was that the words are WRITTEN using the letters, but more often than not they don’t correspond with the SOUNDS used to pronounce those words! It’s the IPA that makes it easier for foreign English speakers to pick up the correct way of speaking in English because those language speakers whose languages are more phonetic (it’s when you read a word just the way it’s written) struggle with English pronunciation big time. So all in all, you can actually say that English has two alphabets – one is the actual letters used to write and the other one consists of the SOUNDS used to speak out loud! Thanks for the second question Ashkeen, and here’s my answer. You can actually use both – Progressive and Simple Present Tenses to describe a person’s personality. Here’s how you do it. Marie is kind and caring. John is smart and intelligent. Use Present Progressive or Simple Present (they’re actually interchangeable in this case!) to describe ACTIVITIES that a person is involved on a regular basis, the keywords here are “always”, “generally” etc. Here’s an article I wrote about this phenomenon of substituting Simple Present for Present Continuous – read it, and everything will become much clearer to you! How to use “have been”? So it’s “have been” that you’d like to find out about? Fair enough – I HAVE BEEN receiving similar questions from a lot of people and now it’s about time they got answered! I have been in prison once in my life and I never want to go back there. I have been in the same night club where you went last night – it’s a really cool place! I have been engaged once in my life but never got married – she just left me. I have been studying for 3 years in college. I have been meaning to call you but never got round to it! I have been reading English fiction for the last 8 years. I have been working for my last company for just 4 weeks now. So basically you’re saying “I have been…”, and then you’re using the main verb in its –ing form and then comes the rest of the sentence. How to use this particular Tense? The key is the time reference – normally you’d use it when specifying a TIMEFRAME, a certain period of time – for 4 weeks, for the last 8 years, for 3 years and so on. Thanks for the question Orlando! Can you tell please whether this bus stops at the next bus stop or it drives straight to the bus station without stopping? We aren’t little children anymore. You aren’t the kind of person you used to be! Aren’t you the dumbest person I’ve ever met? It’s totally OK to start a sentence with a conjunction such as BUT, OR and AND – the widespread belief that it’s wrong to do so is completely misplaced! Or should I say – dangerous – for the simple reason that it limits your ability to express yourself freely. You’ll notice all sorts of English writers, columnists and bloggers starting sentences with conjunctions and there’s nothing wrong with that. Of course – you shouldn’t overuse them; if you start every sentence with BUT or AND, your written peace just won’t “flow” naturally and it will sound awkward. Generally speaking however, there’s nothing wrong with that for as long as it helps you express your thoughts and opinion in a natural way. Can you tell when to use this, it or that. For example: that’s great, it’s great…. Speaking of the examples you’re providing in your question – we normally say “THAT’s great!” as a two-word response to a statement we deem to be great. If, on the other hand, you want to add something onto your response, you would say “IT’s great…” and then you’d say what it actually is you think is great. So basically as a general rule I’d suggest you use THAT when you don’t add anything else to the sentence, and IT – when you say something else after that or if you could theoretically continue the sentence. What’s THAT? (when you see something and you’re referring to that particular object) – in this case you can’t really continue the same sentence. To say something else you’d have to start a new one. What is IT?” (when someone tells you, for example, that something is bothering them, and you want to ask them what it actually is) – in this case you could theoretically continue the sentence by saying “What is IT that’s bothering you?” so you should use IT. Whether the definite article “the” is always used in “of-genitive” or is it possible to use indefinite articles “a” and “an” instead. And let’s try and answer your tricky questions! The plural second person personal pronoun YE – pronounced as [ji:] – was used in Old English to address a number of people as opposed to one person in which case THOU was used. Funnily enough, this personal pronoun is still being used to this day in Ireland which is where I live, and I’m actually using it myself when speaking with Irish people. It’s common-place for me to say things such as “What time are ye going home at?” when speaking with my Irish work colleagues, for example. In your example sentence, however, the word YE is the definite article THE – “On Ye Shoulders of Giants” – so it simple means “On THE Shoulders of Giants”. I just did a research on it, and it turns out the letter “Y” in this word was actually never supposed to be “Y”! They should have used the Old English letter “thorn” Þ instead, and the word YE is actually written as “Þe” – it’s just that printing presses at that time didn’t have the symbol representing the letter “Þ” and so they went with “y” which was the closest equivalent to the symbol they didn’t have. There you go! Sometimes “for” means something like “because of” – yes, I’ve come across such grammar constructs in English fiction a few times and the way I understand, it’s kind of a poetic language. Here’s an example (I’m going to create it myself now): “I will never leave you for I love you too much…” And here’s a song called “For I Loved You” I just found on YouTube proving that my sample sentence contains a naturally occurring collocation. Needless to say, I don’t use this conjunction instead of “because” – let’s leave it to English fiction writers! Although it’s too cold to go outside, I could find my mittens and scarf to prevent frostbite! It’s too cold to go outside. I could find my mittens and scarf, though! That would prevent frostbite. Is the definite article “the” always used in “of-genitive” or is it possible to use indefinite articles “a” and “an” instead. Yes, it is – in collocations such as “a man of a certain age” and “I find this product of a great value!” – but they’re rather exemptions that a general rule (as you can imagine – learning them on an individual basis is the way forward). As you rightly pointed out – normally “of-genitive” would demand the definite article as in “man of the hour”, “king of the jungle”, “enemy of the state” and others. This example is actually quite similar to “product of a great value” – only in this case the indefinite article “a” is replaced with the adjective “little”. I’ve been thinking whether this way of using the preposition “of” is less common or not and I have to admit that yes, it probably sounds slightly different from the typical grammar constructs such as “window of the house” or “door of the car”. Having said that, I also have to admit that if you think about it, it still describes POSSESSION. “My new smartphone is of little practical value”, for example, explains the fact that your new smartphone possesses little practical value therefore for all intents and purposes it still is the genitive case because you can actually rearrange the words to form a sentence “my new smartphone’s practical value is little”. When can I use “seem” and “look like” to describe something? This house seems bigger than the previous one, can you tell me the actual square footage of it? It looks like a nice place to live! He looks like a nice guy! He seems to be a nice guy! When writing a letter, you should be using the first sentence “I’m writing a letter to you about” because you’re in the process of writing the letter RIGHT NOW which demands the Present Progressive Tense TO BE + -ing – it’s used for ONGOING actions. Yesterday my English teacher told me that the verb “to love” can never adapt the -ing form. However, I have just listened to a song called “I’m still loving you” by Scorpions and then there’s the slogan “I’m loving it” by McDonalds’. I feel a little bit confused. Thanks a lot! I love travelling around my country! That’s how this verb is used most often, and your teacher was right about that – people don’t normally say “I’m loving my wife” or “I’m loving listening to music”. There are always exceptions to the rule, however, and you rightly pointed out certain phrases where the verb “to love” is used in the Present Progressive Tense. Are you confused? Don’t be! If you come across such phrases where “to love” is used in its –ing form, just try and put yourself in the situation of the person who would say the phrase and you’ll start understanding why they would say it. For example – imagine you’re sitting in McDonald’s and enjoying your meal and you’re exclaiming “I’m loving it!” meaning that you’re enjoying this experience. The Present Progressive Tense (which is used to describe an ongoing action taking place RIGHT NOW) in this case describes the process of you LOVING the entire experience RIGHT NOW so what you actually mean by saying “I’m loving it!” is that you’re loving having McDonald’s food RIGHT NOW. Generally, however, people express their love toward something in GENERAL terms as opposed to loving something or someone right now at this moment, and that’s why such phrases are rare exceptions. My suggestion to you – you don’t have to use them in your own conversations. Stick with the Simple Present and you’ll be just fine! I have a question that’s been bothering me ever since I’ve been preparing to write an essay. What’s the difference between “If I did something…” and “If I do something…”? This makes me so confused and I don’t know how to choose between these two when writing my essay! This is a very good question, Mag! I’ll try to explain it using simple terms. Basically, these two sentences describe pretty much the same thing – your assumption of what would happen if something happened. The only difference is how you CONTINUE writing these sentences! If I arrivED at work ten minutes later, I WOULD be sacked immediately. If I arrive at work ten minutes later, I’LL be sacked immediately. How to know which sentence to use? If I stayed with my mom for just 10 minutes longer, I WOULD go mad! (obviously you didn’t stay with you mom because you’d be normally making this statement after your visit so your chances of going mad are very small). In reality, however, you could actually go mad trying to analyze whether the particular situation you’re describing is very likely to happen or not, so I’d say please don’t analyze it too much – just use whichever feels right! If I go home now, I’ll make it on time! If I went home now, I would make it on time! and they both sound just fine – so please just write your essay by using your “gut feeling” and choose whichever grammar construct feels right! Any more grammar-related questions? Publish them in the comments section below! Please watch this video: http://englishharmony.com/present-perfect-vs-simple-past/ that I recorded as a response to your question about “gone” and “went” which is all about Present Perfect vs Simple Past! No problem my friend, I’m glad you like this info! “he had overstayed his welcome” – this event happened at some stage in the PAST. “he has overstayed his welcome” – this event is happening right NOW. I don’t really see why the degrees of these adverbs would have to be changed. They sound just fine to me! Change the degree of. Adverb and rewrite thr sentence. (1).could wr talk more frequently now onwards?. (2).she speaks most convincingly. (3).of all my friends she dresses herself most decently. (4).no one in the class comes as laye as her. (5).she doesn’t snore as loudly as her husband. Most cities aren’t kept as clean as Delhi. Sorry, I don’t really get this? Well, considering that “old” is an adjective, it leaves us with “actively”! I’d say this is the positive degree. Speaking of the word “across” – to put it simply, it describes MOVEMENT from point A to B in a situation when there’s something else between them. The easiest way to grasp the concept is to imagine you’re on one side of the street and your friend is on the other – so to get from where you’re standing to your friend, you have to walk ACROSS the street because the street is between the two of you! As for me speaking better than Paul and Rachael – do you mind saying in what way you think I spoken better? Was I easier to understand or something? Complete the sentences with simplr past or past perfect.(1). I ____(read) the much talkrd about atleast thrice. (2).correct the tense if incorrect(1) He revised the entire course before he appeared at the annual rxamination(2). I met my foster parents a number of times before going abroad. Hey please help me with the word ” across ” and its literal meanings . I know the idioms and phrasal verbs that go with the word across but in terms of its literal meanings despite studying English for a long time I have no idea what they are … I would really appreciate it . Thanks in advance my legend …. P.S. in that interview you spoke better than Paul and whatshername despite the fact that they are NATIVE SPEAKERS …..
I’m going to Nainital to attend a workshop on leadership. There’s too many blanks in the next sentence – I can’t figure out what words have to go in there! The bus was late, so we missed the speech. The roads where muddy, and as a result we couldn’t go for a walk. He didn’t study hard, and that’s why he lagged behind. I teased the dog, and it barked at me. We didn’t have the tickets, yet we managed to board the train. Fill in the blanks with appropriate adverbs of reason.the bus was late,___we missed the speech.the roads were muddy,___we couldn’t go for a walk.he didn’t study hard,he lagged behind.i teased the dog,it barked at me.we didn’t have the tickets,___we managrd to board the train. You said that he had misappropriated public money and put a huge amount of money in his Swiss Bank account. We are indeed lucky to have decided to buy this grammar series. You said that he____(misappropriate) the public money, and___(put) a huge amount of money in his account of money in his account with the Swiss Bank. ______no one _____to his leaving the school without permission till today? Please find _fill in the blanks with correct tense form.we are indeed lucky to_____(decide)to buy this get going grammar series of english grammar for enrichment of our knowledge of functional grammar. Despite the fact that I have already followed your blog some time, this kind of articles are really useful even for me because it’s not so easy to get rid of certain wrong habits that I have developed during long grammar-translation studies in the school. Over ten years studying grammar is a long time! I’m not saying that grammar analysis is a total waste of time but rather I think there is still its own important purpose and place for grammar analysis but we have to separate grammar analysis from our speech completely because otherwise it’s not natural fluent process. But anyway I have one question: Do you think it’s possible to get the best possible scores in well-known English language testes such as IELTS, TOEFL and Cambridge exams without learning grammar traditionally at all? If yes, is EH method faster or slower than traditional methods? Personally I have unsure and vague idea that it’s completely possible but it’d be much slower and it’d take too much time and therefore I think it’d be best to combine both EH method and sufficient amount of grammar studying in order to achieve the best possible results in the exams. What is your opinion, Robby? You have much more experience than I have. I think this is really relevant question because specifically any kind of exams and tests are encouraging us to study grammar traditionally! Thanks Carl, I’m really glad you like this article! Speaking of Disqus – was it difficult for you to post the comment? Thanks for your positive feedback, I’m glad you enjoyed the article! Speaking of your question by the way – I did respond to it in the article above, you might have just missed it somehow. It was very informative article. I really love the way you get your creative juices flowing. Now Could we say English language has two alphabets? Thanks Hüseyin, I’m glad you like this article, much appreciated!! !